Jack and the Beanstalk is a slot with five reels and twenty lines. You can play on the slot machine only on all the lines because they are constantly active. The slot offers users a re-spin function with a "wandering" Wild symbol and other original developer finds. There is no bonus game in Jack and the Beanstalk slot. You can download the slot machine for free to try it out in training mode by standard rules. The symbols on the Jack and the Beanstalk slot machine are directly related to the plot of the fairy tale. Here you can see Jack himself, a two-headed giant, a goat, an ax, a watering can, as well as a denomination of playing cards from ten to ace. Wild is the trademark Jack and the Beanstalk logo. When it appears on any reel, the free spin function is activated. With each turn, Wild moves one drum to the left. All payments involving this symbol are in triplicate. This option also works during free spins. Scatter is a picture of a chest. When the drums fall from three Scatter in any position, the user gets the right to ten free spins at the current bet. If three or more Scatter appears again during these rotations, five more turns are added. During free spins, a key may seem on the fifth reel. Their number is counting, and then the player can get the right to additional privileges. They are expressed in the expanded possibilities of each new Wild, appearing on the screen until the end of the round. Settings allow you to select the window size, mute the sound, activate the fast spin and make other changes to the interface. 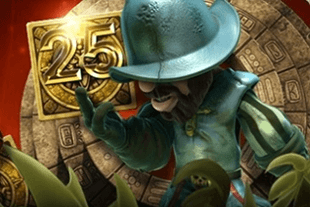 The Jack and the Beanstalk slot is fun and full of humor slot with excellent graphics, cool free spins, great special characters and lots of other player-friendly options. There are low payout ratios, but combinations are formed very often, and every appearance on the screen of the symbol Wild promises a decent win.